Cincinnati Reds first baseman Joey Votto struggled with injuries in a 2014 campaign that lasted just 62 games. After playing in all 162 games in 2013 and slugging 24 home runs with a .435 on-base percentage, Votto hit just six longballs with a batting line of .255/.390/.409 before injuries ended his season. Consequently, the Reds suffered, finishing 28th in the major leagues in runs scored and posting a batting line of .238/.296/.365. Household names Brayan Pena, Neftali Soto, Donald Lutz and Jack Hannahan all manned first base. The Canadian has already matched his home run total from 2014, with six home runs in his first 14 games. He’s put together a .377/.492/.792 line to this point. Only Nelson Cruz of the Seattle Mariners has more home runs with eight. It’s very early in the season, and drawing conclusions from such a small sample can be treacherous. Votto won’t challenge Barry Bonds single season home run mark, and chances are he won’t top the 37 home runs he hit in 2010. Nevertheless, the fact that the 31 year-old has already hit six home runs indicates that he’s much more healthy this year than last. Votto has been one of baseball’s best hitters since his first full major league season, which came in 2008. In 2010, he mashed a career-high 37 home runs and produced +7 fWAR with a remarkable .316/.424/.600 line for a 172 wRC+. He hasn’t matched those power numbers, but Votto has been an on-base machine. Though he appeared in only 111 games in 2012, Votto tallied nearly +6 fWAR with a .474 on-base percentage. For his career the Reds first baseman owns a .311/.418/.537 slash line for a 156 wRC+. 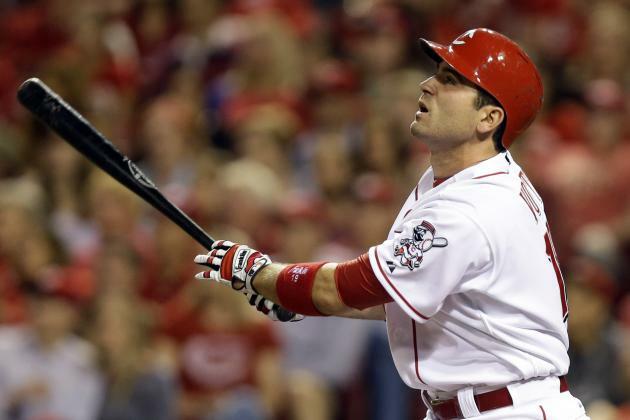 With his hot start, ZiPS and Steamer both project Votto to top those numbers. A healthy Votto is a dominant offensive force and if his knee and quad issues are behind him, Votto will remind everyone how he’s one of the five best hitters in the game.